This shouldn’t be surprising, but median family income and related income/economic measures are well correlated with parental education levels. This is particularly true when we aggregate them at a school district level. To simplify this analysis and sidestep potential arguments about racial inequalities (e.g., school funding, teacher quality, etc) throughout this post I am going focus entirely on non-hispanic whites (“NHW”) except for tests where data by race/ethnicity is not available. As you can see, as we aggregate this same data together the relationship between median family income and average parental education statistics at the school district level, the relationships become very strong and appear to be practically linear. No doubt I could make similarly misleading statements about the strength of the correlation between these highly aggregated statistics, like Catherine Rampell did for the SAT aggregates: “R2 for each test average/income range chart is about 0.95“. Nevertheless, we can clearly see that neighborhoods with high family incomes tend to similarly above the national averages by family education levels and vice versa for low income districts. Using this rationale, median family income just measures how well educated the families are too! Clearly this is all nonsense. These statistics are obviously fairly well correlated, but when you aggregate on one dimension (e.g., income) the other sources of variance (e.g., random chance, regional economic drags, etc) tend to get averaged out, which invites an exaggerated impression of the strength of the underlying relationships. The strength of these economic-outcome correlations varies according to how well correlated they are with family education levels. 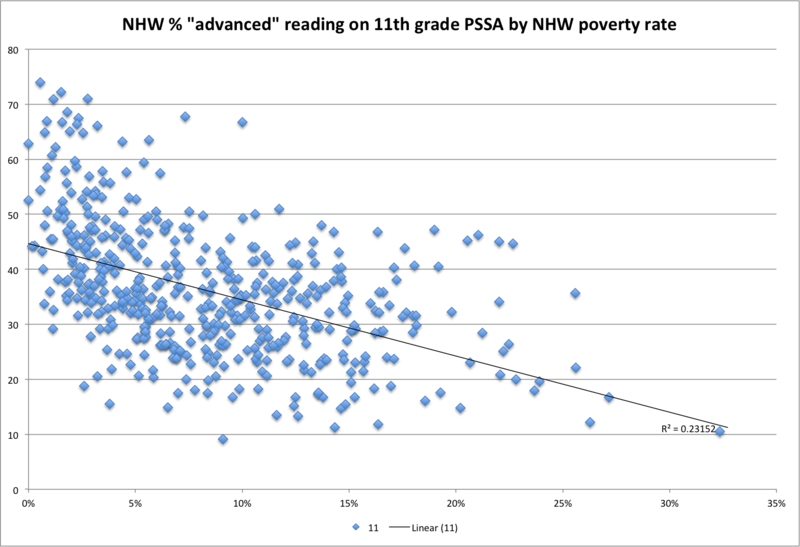 Below is a comparison of the over-prediction for non-hispanic white 11th grade reading scores (“% advanced”) based on the percentage of NHW school district families with bachelors degrees or higher, expressed in percentage points, by family economic measures. 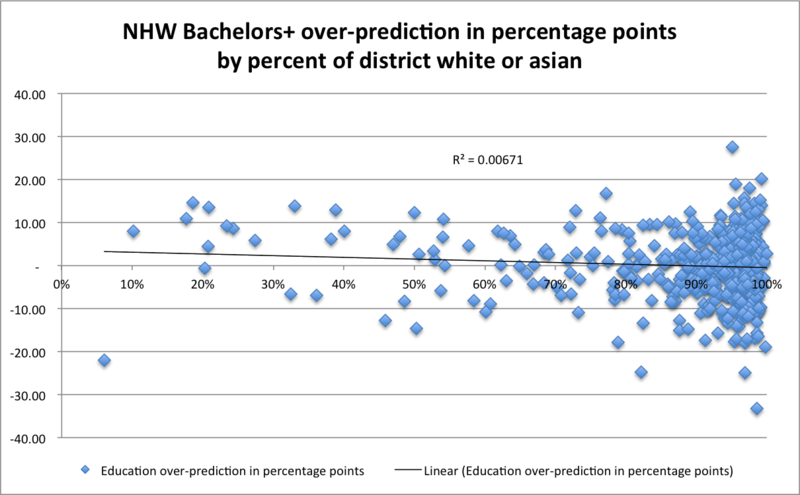 Negative values imply that the school district performed better than expected (under-prediction) based on % of NHW families with bachelors or higher alone; positive values imply over-prediction. As you can see, there is some variance from the prediction, but there is little to no evidence for systematic variation with family economic measures of this sort (or, at least not above and beyond that which correlates with family education levels). I suspect I could tighten the education model up better by adjusting this further for districts that have larger or smaller shares of less educated groups (<HS, HS-only, associate-degrees) than would be expected by the BS+ percentage alone, especially in more heterogeneous districts. Note: both of these measures move in an “unexpected” direction. So total is uncorrelated, local is negatively correlated (i.e., more $ = under-prediction), and non-local spending is positively correlated (i.e., more $ = over-prediction). All of this is completely consistent with the notion that actual variances in school spending have virtually no incremental effect on these outcomes (at least), but that, to the extent that spending reflects incremental information about the parents (higher or lower SES than % college grads suggests), we can predict some subtle differences. Likewise for a direct measures of average school district SES. 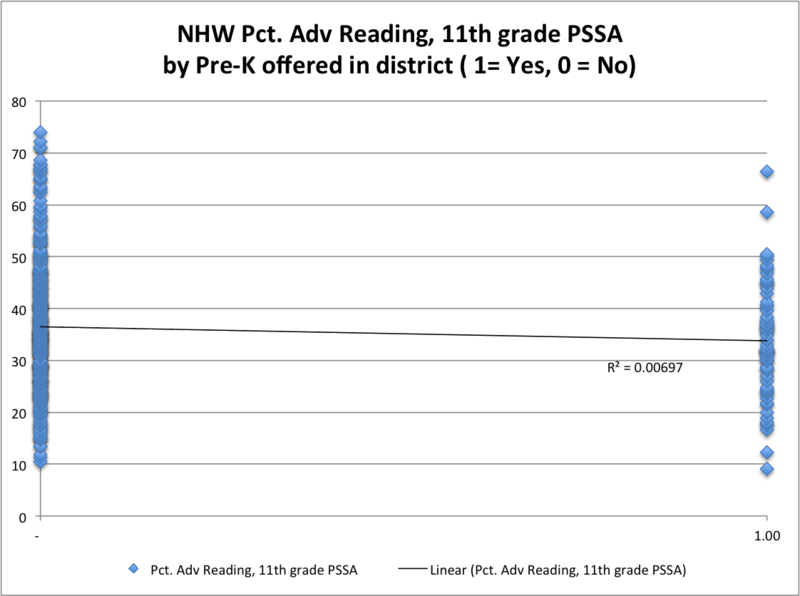 If we try to predict 11th grade NHW reading scores based exclusively on 3rd grade reading scores…. Again, we find the same patterns with these other measures…. Note: These correlations are significantly stronger than the 11th grade PSSA scores I reported above for non-hispanic whites,but that’s probably because this data is for all racial/ethnic groups (they don’t provide SAT data at this level of detail) and the variance with all groups is larger than within groups. Note: The “effect sizes” of parental education are generally much higher than parental income. As Robert VerBruggen of Real Clear Policy pointed out, the relationships with ACT and income are practically the same. If we instead take 4 years worth of cut scores for NHW, convert them into SD units above/below mean, and take the average it tightens up considerably! And the relative strength of the relationships don’t seem to change either….